There are a few choke points to be aware of when tackling a home painting gig. Among them are picking the right paint, doing correct prep work, and covering the walls well. Somewhere between gobbing paint on the wall and cleaning up comes the part that separates the pros from the noobs: edges. 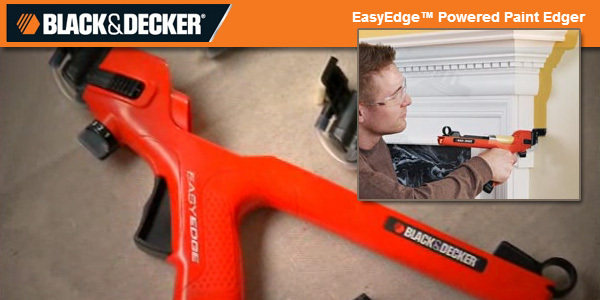 Black & Decker thinks their new EasyEdge powered paint edger will help blur the line between you and a pro, so to speak. The EasyEdge injects paint into a tube and pushes it through the foam paint pad at the head in an evenly distributed manner. An edge on either side keeps the paint in a neat line. A knob at the bottom controls the effective flow, and the trigger lets the paint loose by pushing the plunger. A professional painter would, of course, know how to get edges covered without such a device, and after having seen a few painters work, I’m sure they could do it in a third of the time, too. However, I’m not a pro, and with the times I’ve painted a room averaging out to once every 5 years or so, any advantage is more than welcome. In short, if you think you need to paint and this will help, try it out. Unless you plan to paint rooms on a regular basis, the only thing that matters is if you can live in the room afterward. If you think the answer might be no, either seek assistance or get as much equipment to cheat your way through it as your budget will allow. Street pricing starts at around $30 for the edger itself, with the disposable paint head and tub running about $6. I’m a sucker for gadgets like that, but this time I think I’ll just stick with the masking tape and a light touch with a good brush — and I am not an expert painter. I dont know if i would put down the money for this but I got a pretty good price on a black and decker rapid roller and it’s pretty nice. PITA to clean, though. Ahaha that puss is wearing safety glasses with his B&D POS. They had these on a demo table at Home Depot this weekend. I wanted to try it but the paint cartridges were all empty and I was in a hurry. If anyone here gets a chance to use one post the results. I fell for the “power painter” wall roller. While it saves a bit of time while painting, it takes as long to clean as it took to paint and clean up is extremely messy to boot. If you fail to clean it, as soon as the paint dries, the tool is toast. I’ll stick to the analog roller. I’ve always used a edging pad to cut in and had excellent results. Costs less than this thing or masking tape. It also give you about two time the width which makes it easier to not tag the wall when you start filling in with the roller. I was curious when I saw this on the B&D website. According to the reviews on Amazon, it is a piece of junk. I’d gladly take a few Purdy 1-1/2″ sash brushes, or Shurline edgers for the same price, thanks.